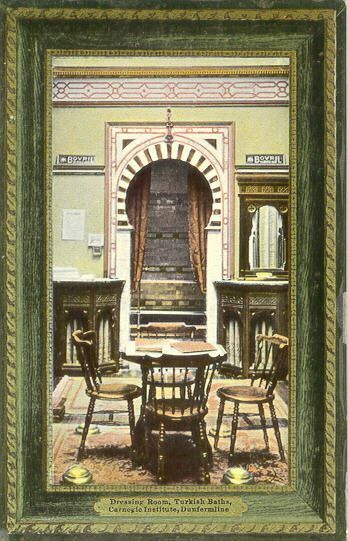 Pre-1910 picture postcard of the cooling-room in the Carnegie Turkish Baths, Dunfermline. Although the caption on the postcard suggests that this is the changing room, the picture is actually of the cooling-room; the changing rooms are to the left and right, as can be seen in another photograph illustrating our article on the history of these baths. The photo on this page was probably taken at a slightly later date since the potted plants have been replaced by notices and a decorative mirror, and advertisements for Bovril have been placed on the wall.